PHILADELPHIA (WPVI) -- When it comes to potholes, they usually leave a bad taste in your mouth. Well, Friendly's is trying to change that. 'Nor'easter Pothole' consists of chocolate ice cream swirled with black tar fudge, with crushed chocolate creme cookie gravel and asphalt chocolate chips. The words tar, gravel, and asphalt never sounded so delicious. Last week, Action News reported potholes, in non-dessert form, have been popping up across the Philadelphia region. PennDOT says drivers can blame the weather for the majority of them. They say crews are patching about 60 to 70 highways a week to keep up with demand. PennDOT says the best thing to do is watch your speed and try to avoid potholes safely. Potholes popping up, plaguing drivers across the area. Gray Hall reports during Action News at 4pm on February 9, 2018. If you encounter a pothole problem in Philadelphia, you can call 311. If you are on a Pennsylvania road, call PennDOT at 1-800-FIX-ROAD. 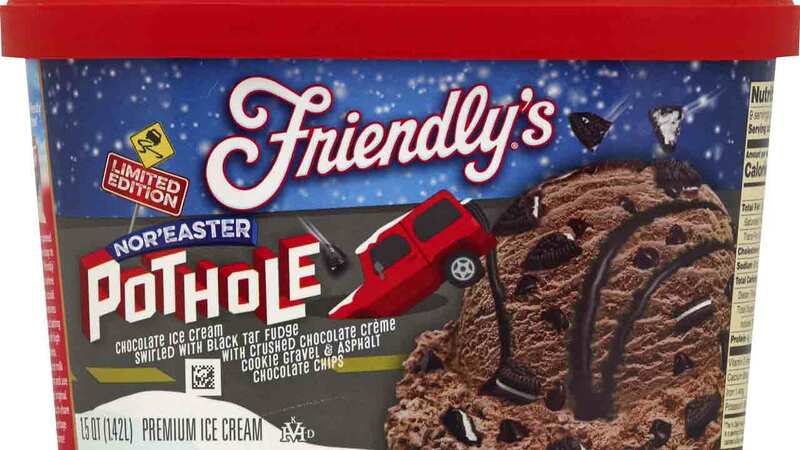 Meanwhile, Friendly's says their 'Nor'easter Pothole' ice cream will be available in stores through April or while supplies last. Hopefully, the real potholes won't last as long.